Former undisputed middleweight champion Gennady ‘Triple G’ Golovkin 38-1-1 (34) is the top pick for new WBC super middleweight champion Callum ‘Mundo’ Smith’s inaugural title defence. 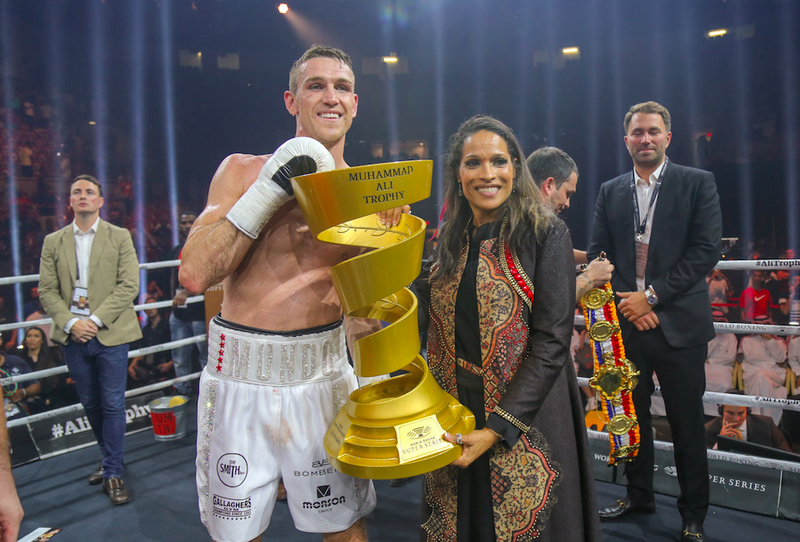 The 28-year-old Liverpudlian scored an impressive seventh round knockout win against George Groves in the final of the World Boxing Super Series in September to claim the Muhammad Ali Trophy in Jeddah, Saudi Arabia. Promoter Eddie Hearn wants Smith 25-0 (18) to defend his title against Golovkin at Anfield in May. “I’ve spoken to Tom Loeffler [‘GGG’s promoter] about it before,” Hearn said to Sky Sports. “Not since the press conference last week though. “That’s my number one choice for Callum Smith. I think it’s a fight that fills Anfield. It’s a great profile fight, it’s a great fight, full stop. Golovkin is coming off a 12-round majority decision loss to Saul ‘Canelo’ Alvarez 50-1-2 (34) at the T-Mobile Arena in Las Vegas, Nevada in September in their heated rematch of their 12-round split draw a year earlier. The popular 28-year-old Mexican is scheduled to return to the ring in December when he takes on WBA ‘regular’ super middleweight titleholder Rocky Fielding 27-1 (15) at New York’s Madison Square Garden. The 36-year-old Kazakh bomber, a career middleweight, is reportedly keen to get his revenge against Alvarez in a third fight to complete their trilogy and a move up to the 168-pound weight class to face a 6-foot-3 puncher in between might represent too big of a risk. “If he [Golovkin] is even close to the mark in terms of weight at middleweight, it might be a good option,” Hearn continued.